A tour of all the micromanufacturing research and production factories in Texas would have only one stop: the Texas Microfactory in UT Arlington’s Automation & Robotics Research Institute. Micromanufacturing refers to the standardized manufacturing of devices with micron-size components. One millimeter contains a thousand microns. 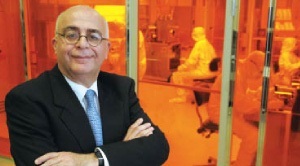 Under Dr. Harry Stephanou's direction, the Texas Microfactory focuses on commercial applications for micron-sized devices. In short, tiny. Not nano tiny, but clearly headed in that direction. Scheduled to receive a $3.5 million federal grant from the Office of Naval Research, the Texas Microfactory is a one-of-a-kind, low-cost clean room that aims to demonstrate reconfigurable microengineering and micromachining with large commercial potential. It’s a place where theory meets pragmatic purpose. The clean room that houses the factory, currently about 900 square feet, is set to double in size. It’s an ambition that comes with considerable economic consequences. The global market for microsystems in 2007 was about $55 billion, with an annual growth of 20 percent. Major industrial sectors include consumer products, the defense industry, health care, communications and transportation products and applications. "Micromanufacturing is typically knowledge based and also low volume. We want to grow smart manufacturing that stays in this state and nation." The Office of Naval Research, for instance, wants to study the feasibility of very small mobile sensors to determine how they might be manufactured, as Stephanou would say, faster, smaller and cheaper. The Texas Microfactory is loaded with equipment capable of assembling such small devices, and it can provide the microengineering research for designing packaging to protect such devices along with “interconnects” with other devices. Though substantial research is involved in such complicated manufacturing processes, Stephanou emphasizes that the goal is commercial use. And, he says, the Texas Microfactory is only the first step in a three-part growth process. Step two is to build a dedicated pilot production facility (he hopes to accomplish this in two to three years), and step three is the construction of full-scale micromanufacturing production facilities. A critical consideration in this process will be the development of more micromanufacturing engineers, a multidisciplinary field with an enormous shortage. Stephanou is working on a proposal for UT Arlington to offer a microengineering doctoral degree. The institute director visualizes a program in which graduates serve internships at the microengineering factory, much as physicians serve a residency in hospitals.